He is calmest, sweetest dog you will ever meet and would be good in a house with seniors, kids, cats, dogs and most of all his furever parent(s). Please fill out an adoption application if you would like to share your home and love with Rusty! Rusty has an autoimmune disease that is non-life threatening, but will require a lifetime of maintenance medication, because of this he does have allergies and skin infections (minor and under control). Rusty is looking for his forever home. If you think it could be yours, read more about Adopting from BDRA before submitting your application below. BDRA relies on your donations to rescue blind dogs around the United States. Please consider giving in support of Rusty. Loves people and other dogs, isn’t too crazy about being crated. Still needs a pill a day of Atopica, 2-3 week medicated bath for skin, and eye drops in both eyes once a day. He will bay at breakfast and dinner time. He is doing better since he got here, loves to cuddle or sneak a dog bed for himself. Respects other dogs if they tell him so. Relative easy dog sans the medications. He appears to have beaten his infection and is on the road to recovery. However, to keep him looking svelte, he needs to stay on Atopica daily and get medicated baths (weekly). If these 2 items are not performed, Rusty’s autoimmune issues will take over and turn him into the ‘elephant dog’ with bad swellings on his face, paws, and legs, not to mention hair loss from the itching that comes with it. For a high maintenance dog, Rusty handles the baths with a good disposition and loves to cuddle afterward. Rusty is currently re-learning what housebreaking means =) He is living a with other dogs and learning to go to the door when he has to go potty. 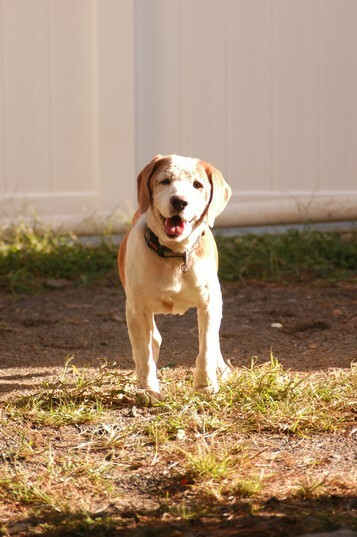 Rusty is adventurous and stubborn which is typical of the Beagle breed, but he is very food motivated and now knows to ‘sit’ and ‘beg’ for treats. Rusty is a nature small game hunting breed that shows great interest in small animals (such as rabbits and ferrets) so he needs a family where he can be the center of attention. Rusty is a good dog, loves his cuddles with people, and loves being around everyone. He gets along with other dogs (resting his head on those who will let him), he’s decent on leash and loves to let his nose lead him everywhere. If you open your heart and home to Rusty, he will love and entertain you forever. 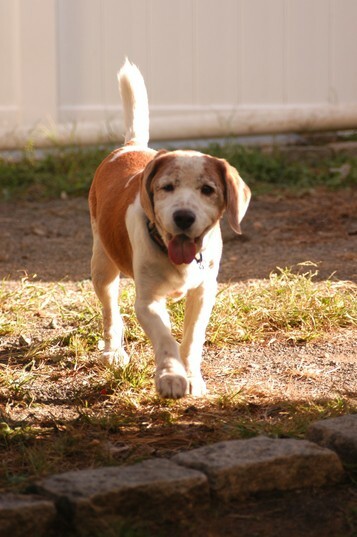 Rusty is house trained if walked regularly or crated but requires puppy pads when not and is trained to go on the pads. He is a relaxed and calm dog who gets along with everyone and just needs to be around people! He is not very active and likes to cuddle in bed with his human. When surround by many cats, Rusty shows no real interest. He will interact with other dogs but doesn’t really play with them. He is OK with them playing around and even on him! He is calmest, sweetest dog you will ever meet and would be good in a house with seniors, kids, cats, dogs and most of all his furever parent(s). Please fill out an adoption application if you would like to share your home and love with Rusty!